The Indoos stalled Monday almost precisely at the 25,440 midpoint Hidden Pivot shown. Buyers subsequently gave up almost no ground, setting up a likely move past the resistance on Wednesday. If it’s decisively exceeded, that would all but clinch more upside to the 25,998 target. This was already no worse than an even-odds bet because the initial thrust, labeled A-B in the chart, exceeded two prior peaks without taking a breather. 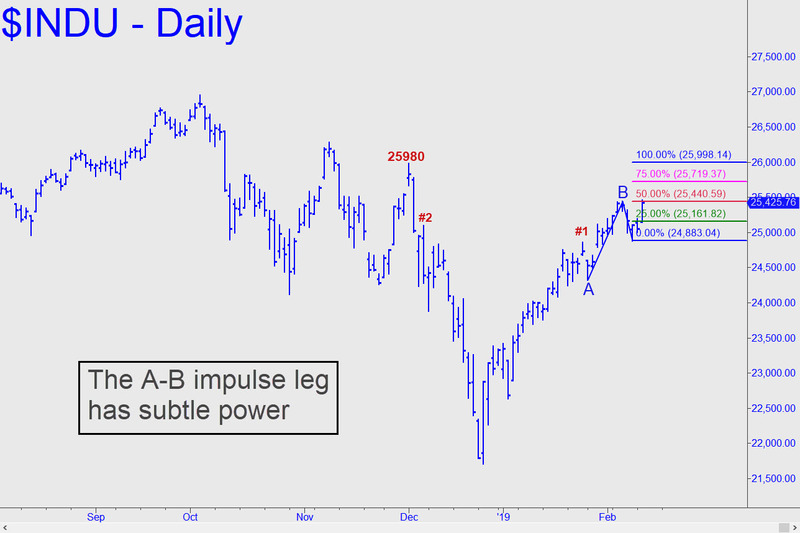 That created a powerful impulse leg; however, an even more powerful one would occur if the target is hit, since it lies slightly above a key ‘external’ peak at 25,980 recorded just before the stock market began to fall apart in early December. Technical analysis aside, you can use your eyeballs to answer this question: If the Dow reaches the 25,998 target, will it be close enough to new all-time highs to make them likely? Whatever your answer, the very possibility will be foremost on traders’ fevered brains, conceivably ‘magnetizing’ October’s all-time high at 26,951. ______ UPDATE (Feb 13, 4:56 p.m.): Today’s action, which featured a pop to 25626, followed the script above. Please note that a pullback today to the green line at 25161 would trip a mechanical buy, stop 24,883. _______ UPDATE (Feb 14, 5:20): No change.